November is National Diabetes Month in the United States and today, November 14th, is World Diabetes Day. 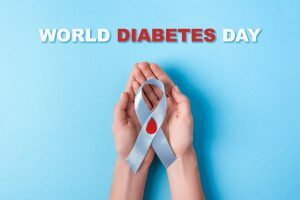 The purpose of both the month and the day is to bring awareness to Type 1, Type 2, and gestational diabetes. The dental team here in Sheridan, WY wants to take this opportunity to educate you on the two-way relationship between diabetes and periodontal disease. Having a better understanding on this link between diseases can be important in maintaining your health. For someone living with diabetes, managing blood sugar and insulin is always a matter of life and death. It is a daily struggle that many learn to live with and to live healthily and well with. However, gum disease or an infection of any kind can increase the levels of glucose in the blood. For someone with diabetes, this can make regulating blood sugars an even more difficult task. Managing the infection of gum disease becomes very important. It is also important to talk to both your endocrinologist and your dentist if you have diabetes and/or gum disease. People living with diabetes also have a higher risk for developing gum disease. One reason for this increased risk is that diabetes limits your body’s abilities to fight off infection. A second reason is that the high glucose levels in the mouth (that someone with diabetes is more likely to have) can create a good home for bacterial build-up. Because of all these reasons and for the ways that gum disease can be dangerous to a person living with diabetes, it is very important for a diabetic to take extra precaution and preventive measures when it comes to gum disease. Good oral hygiene, frequent dental cleanings and exams, and good overall nutrition can all be ways to help keep gum disease at bay. There is a link between oral health and all types of diabetes. Schedule a consultation by calling Grinnell Street Dental in Sheridan, WY, at (307) 672-7567. We also proudly serve the residents of Gillette, Billings, Miles City, and all surrounding communities.